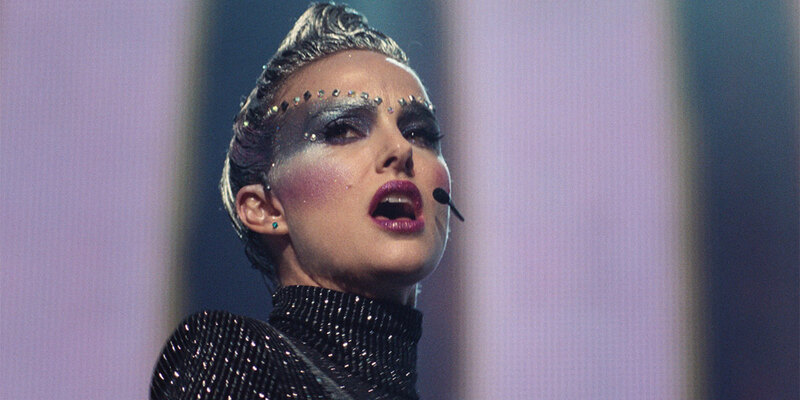 Vox Lux review: Natalie Portman goes gaga in a modern study of celebrity as a primadonna pop star with a horrific history in Brady Corbet’s 21st-century portrait of fame and fallout. There’s a moment early on in Vox Lux that surprised and shocked me so much that I feel a little hesitant to reveal it in this review. I will warn of spoilers but do note that the following takes place in the opening few minutes of the film. Its 1999 Staten Island, New York, and we find ourselves in a school classroom. Everything seems normal, that is until a camera pans to a school teacher going about her instructions to the class in front of her. Before we know it, gunfire erupts, and she is killed instantly in front of the 14-year-old children, the gunman then turning his gunman towards them. Amongst the kids is Celeste, here played by Raffey Cassidy, an outgoing student who confronts the gunman, seemingly one of her peers, who still, after an initial conversation where she attempts to calm him, shoots her in cold blood. Celeste survives the attack, though sustains a life-changing injury to her neck and back. Months of rehabilitation follow, during which time the young, wannabee songstress composes a song which is to become the soundtrack for the horrific event. At just 14, she is pursued by music yes men, including Jude Law’s smarmy, though caring manager, all wanting to transform her into the next big thing. Fast forward a couple of years and the young songstress is being shipped off to Stockholm (it’s in Europe, notes Law’s character, billed as simply The Manager, a purposely scruffy looking hipster), to work with a top producer to produce the next massive hit. Along for the ride is Celeste’s sister Eleanor (Stacy Martin), who you’d think would look out for her best interests but instead dolls her younger sibling up to get into clubs to make the most of the local hospitality. The first act culminates in the devasting attacks on the World Trade Centre in 2001, and we’re then catapulted forward in time some 16 years, Natalie Portman now assuming the role of Celeste, her career having massively peaked, and indeed troughed with a controversial road accident that painted her is a very different light to the media, and ultimately to her fans. We re-join her in a New York hotel following another massive tragedy, the effects of fame deeply rooted, Eleanor once again in tow along with Law’s manager and Celeste’s teenage daughter, also played by Cassidy. The film tracks the events of that day, which lead up to a return concert in front of 30,000 fans in her hometown. Vox Lux is an interesting feature. At a festival that also debuted a feature that also deals with celebrity, the celebrated A Star Is Born with Bradley Cooper and Lady Gaga, Corbet’s film couldn’t be any different. He kicks off proceedings wit ha full scrolling credits sequence at the start and employs the use of Willem Dafoe’s familiar voice as the narrator, something which continues during the feature’s two-act structure. The film has mainstream appeal with art-house sensibility. Its main asset is the two fine performances from Portman and Law, the former delivering another fine, very different and challenging turn as the perfect pop diva channelling the likes of everyone from Gaga herself to Madonna (albeit with new, original songs from Sia). It’s the best Law has been for years, but for me, it was Raffey Cassidy who truly surprises. The young actor, last seen in 2017’s The Killing Of A Sacred Deer, is perfect as the young Celeste, and even nails the wavering accent – she uncannily like Portman who has the difficult task of following the young Cassidy’s turn in the first third. As Celeste’s daughter, Albertine, Cassidy transforms herself again in the second act, so much so I had to question whether it was the same person. Thereis also brilliant support from the likes of Christopjer Abbot, a wonderful Jennifer Ehle as the typical, overbearing publicist, and Martin as Eleanor. The style and slightly off-beat, art-house nature of the film won’t appeal to all, but there is a lot going on here and many conversation starters raised. It examines the ridiculousness of celebrity, focusses hard on the circus that revolves around it, and questions everything to do with it in oh such a unique way. Besides that, there’s also a brilliant musical performance by Portman late on which really warrants the entry price alone. Vox Lux was a true surprise – an almost antidote to A Star Is Born. While that film is oh so very good in its own way, this darker effort flips the coin and gives a truly inimitable alternative that really shouldn’t be missed. Vox Lux review by Paul Heath, September 2018. Vox Lux was reviewed at the 2018 Toronto International Film Festival. Click here for all of our coverage. The cast is outstanding - particularly Raffey Cassidy, in this well-directed and very different look at pop culture in modern America.